BookYap’s Review: Have you ever pick up a book, reading just its’ table of content, the first chapter, and its’ published date were enough to make you want to kick yourself in the head for not putting up more effort years ago to find that book. That was how I felt about when I first got my hands on this book. To me, no matter how good you are at leadership and managerial skills, hired low performing players will make your job an uphill battle. At the same time, placing your company at a disadvantage among competitions in multiple ways. Thus, if you are an entrepreneur, the CEO of a company, or the Director of Human Resources of a company, this is the book you should read. After reading the introduction and the first chapter of this book, I wish I had read this book a long time ago. That would have saved me lots of time and headaches from managing the mis-hires. 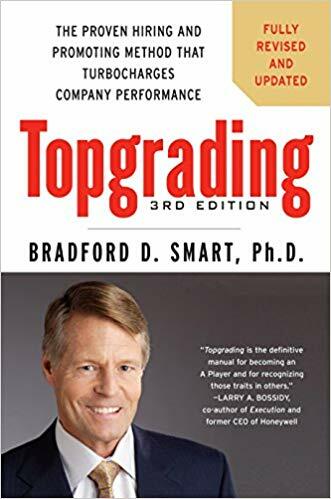 Over the years, I have learned (through the “school of hard knocks”) to increase my hiring success rate may be about 45%, but with the process Dr. Bradford D. Smart layout which backed up with many proven successes, I’m excited to finish reading this book and apply what I deem insightful to drastically increase my chance of getting more A players to my teams. I like how the author uses his website to supplement this book with additional materials (both paid and free online resources). It’s good to learn the common characteristics of A Players so we can watch for them. The author also provided strong arguments for the benefits A Players will bring to an organization, especially the quote “A Players are talent magnets.” One good example of that is the company Alphabet (formerly Google). Even if Alphabet offers an average salary as the industry standard, I believe there is still be a large percentage of candidates who would love to get in, just because they get to work with A Players similar to them. In addition, to support his claim of 25% percent success rate (able to hire A Players) among companies when hiring, the author provided more detail from years of research as evidence. For me, that evidence is convincing enough to use the 25% as the baseline to see how much I can improve my stat after applying the process of Topgrading.